Why is a product backlog important? If you're seeking a GitHub Issue tracker, Boards can be one of your most powerful tools – but they're only as useful as you make them. A product backlog represents feedback from multiple sources, like other developers, sales, business development, but most importantly, your users. It's your job to take in that feedback, prioritize it, manage it, and work it into the future of your product. Without a process, your Boards can become clogged with inactionable feedback and a lack of focus. In contrast, a well-managed backlog leads to a more efficient and focused team. The result is a better product, and one that your customers actually want to buy. Here's our recommended sprint-based workflow that can help bring clarity to your product. New feedback and ideas automatically land in the New Issues pipeline. The product owner reviews each Issue and figures out if it's actionable. Note: “Product owner” refers to whoever makes the ultimate call as to what is built and when. Typically, it's a project or product manager. If you intend to complete an Issue but it's not ready for development (ie it needs more detail or the team has no capacity for extra work), the Issue is dragged the Backlog. Issues here don't yet have a Milestone. You'll add one at the beginning of a sprint. 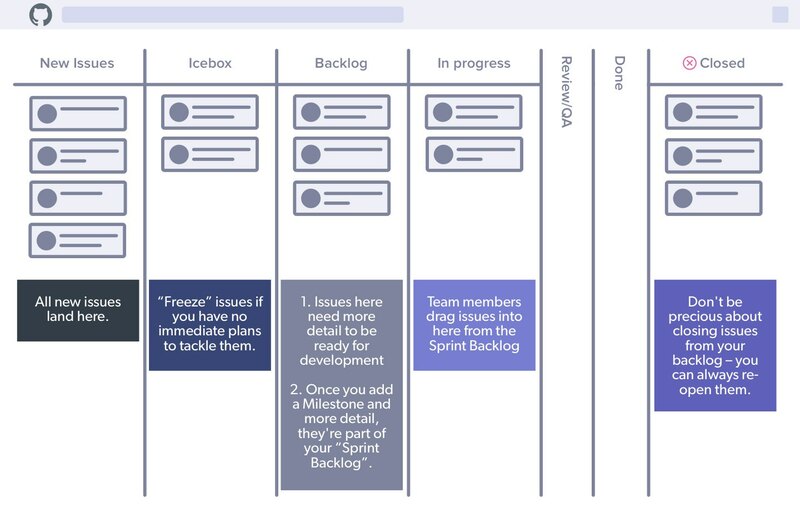 If it's a valuable Issue but you have no plans to tackle it in upcoming sprints, “freeze” it in the Icebox pipeline. If the issue isn't going to get done, just close it. If it's really that important, you can always re-open it later! When the sprint begins, simply filter the Board by Milestone to see what needs to be done. Team members can drag tasks off the top of the backlog to indicate they're being worked on. Simple!